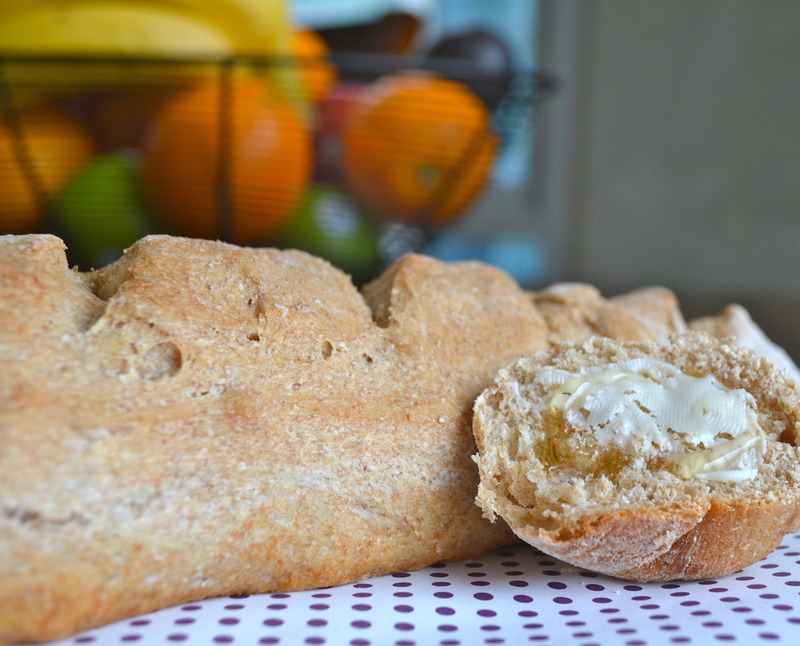 Homemade Whole Wheat Baguettes | how 'bout some cake? This is the perfect starter recipe. It’s fairly foolproof, and just requires a food processor. And did I mention it’s ready in an afternoon, as opposed to the 10+ hours that some other bread recipes require? I got the recipe from a very talented food blogger, The Faux Martha. 1. In a food processor, combine the flours, salt, sugar, and yeast. (You can mix the dough by hand, but it will take longer; use a big bowl and a wooden spoon or sturdy rubber spatula.) With the machine running, pour about 1 1/2 cups water through the feed tube. Process until the dough forms a ball, adding one tablespoon more water at a time until it becomes smooth. You want a pretty wet but well-defined ball. The whole process should take 30 to 60 seconds. If the dough becomes too wet. add 1 tablespoon at a time and process briefly. Put the dough in a large bowl, cover with plastic wrap, and let rise at room temperature until doubled in size, at least one hour. 2. Lightly flour your work surface and hands and knead the dough a few times. For small baguettes, divide the dough into 4 pieces, for larger ones, make 2. Roll each piece of dough into a log of any length that will fit into your oven. If you plan to bake the loaves on a sheet pan, lightly grease it with oil and transfer the loaves to the pan. Cover with a towel and let rise until the loaves are puffed to almost twice their original size, 30 minutes or so. Heat the oven (with a pizza stone if you have one) to 400° while you let the baguettes rise. 3. When you’re ready to bake, slash the top of each loaf a few times with a razor blade or sharp knife. 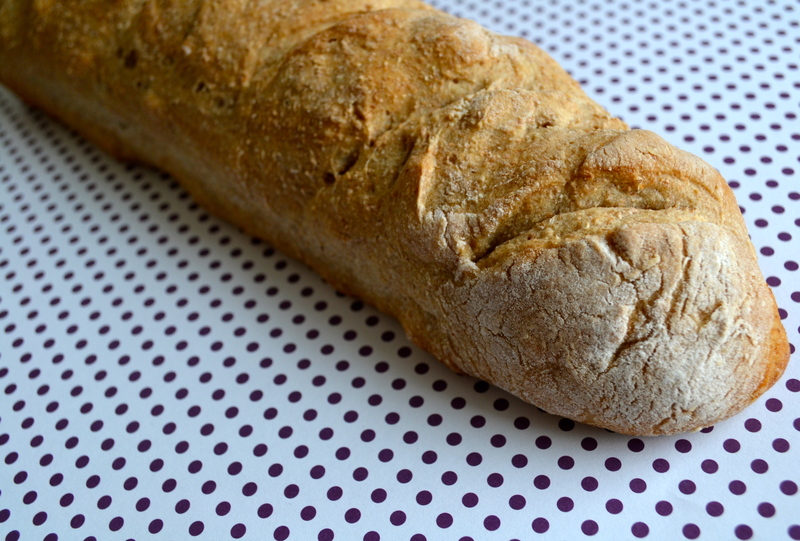 If you are topping the baguettes with seeds, brush each loaf with a little water and sprinkle them on. If you are using a pizza stone, gently transfer the loaves to the stone with a floured rimless baking sheet, lightly floured plank of wood, or flexible cutting board. Turn the heat down to 375° and bake until the crust is golden brown and the internal temperature is at least 210° (it can be a little lower if you plan to reheat the bread again later) or the loaves sound hollow when tapped, about 30 minutes. Remove, spray with a bit of water if you would like a shinier crust, and cool completely on a wire rack before slicing. My favorite topping so far is honey butter, but jam was also good. I can’t wait to serve it tomorrow night at our potluck wine & cheese tasting! 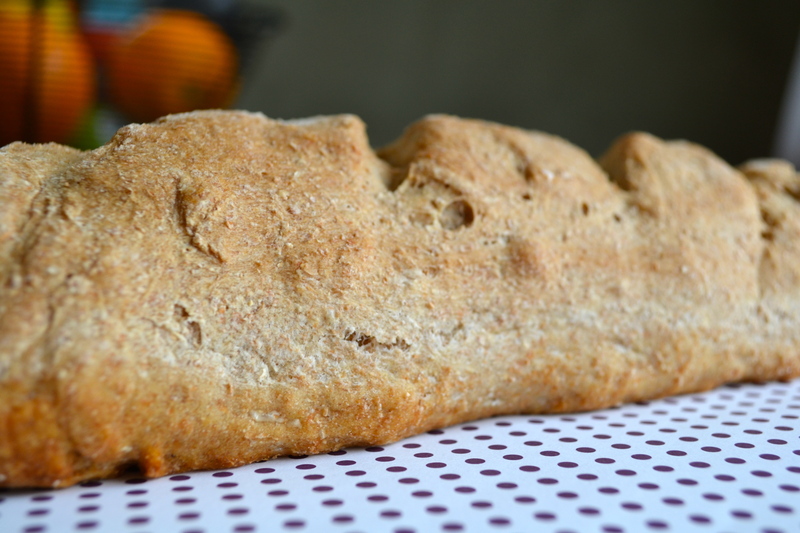 This entry was posted in Food & Recipes, Healthy meals & snacks and tagged baking, bread, recipes, whole wheat bread. Bookmark the permalink. What utterly beautiful looking bread! Great recipe. This looks amazing. Def going to give it a try! oh my gosh yay! 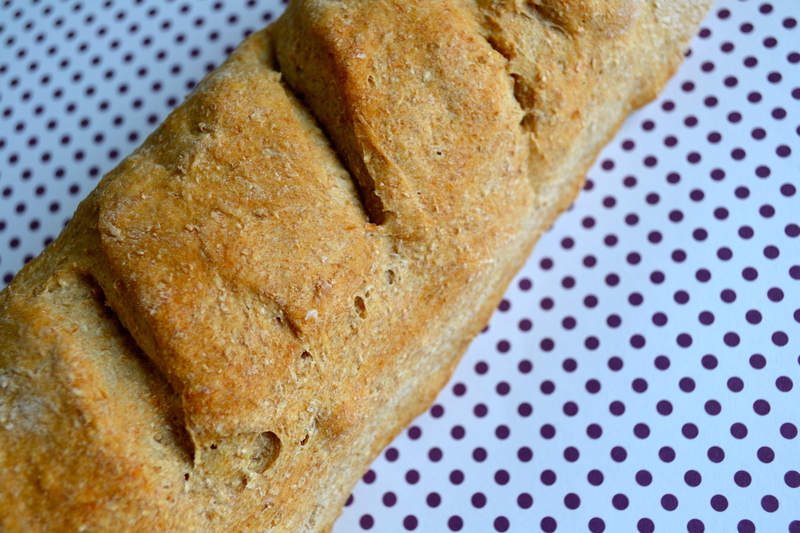 🙂 ive been looking for a good whole wheat baguette, and i believe I’ve found it! 🙂 your blog is so cute by the way!